This fantastic large model Parasurolphus stand 8ft high and is a stunning model for any Dinosaur or Jurassic themed area. 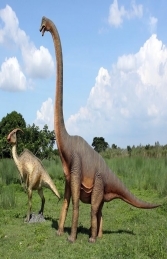 Parasaurolophus is a genus of ornithopod dinosaur from the Late Cretaceous Period of what is now North America, about 76-73 million years ago .Parasaurolophus had an elongated, bony crest on its head with which it may have made low-frequency, fog-horn-like sounds. Our Parasurolophus stands on his own rock formation and would be great to use in any Dinosaur or Jurassic themed scene, theme parks and museums or even in your own garden or woodland. It looks great with our other small dinos. The Baby T.Rex (JR 1593), the Baby Triceratops (JR 1594) or beside the huge Brachiosaurus (JR 080130).